One of the duties of the Freedmen’s Bureau was to assist displaced or refugee Freedmen with transportation to another location. The bureau provided transportation for a variety of reasons – to help reunite families, to help Freedmen find employment, to help minor children find secure homes. The transportation order below, dated July 9, 1867 authorizes agents of the Freedmen’s Bureau to transport Jennie Thornton, age 8, from Washington, D.C. to Jamestown, NY . 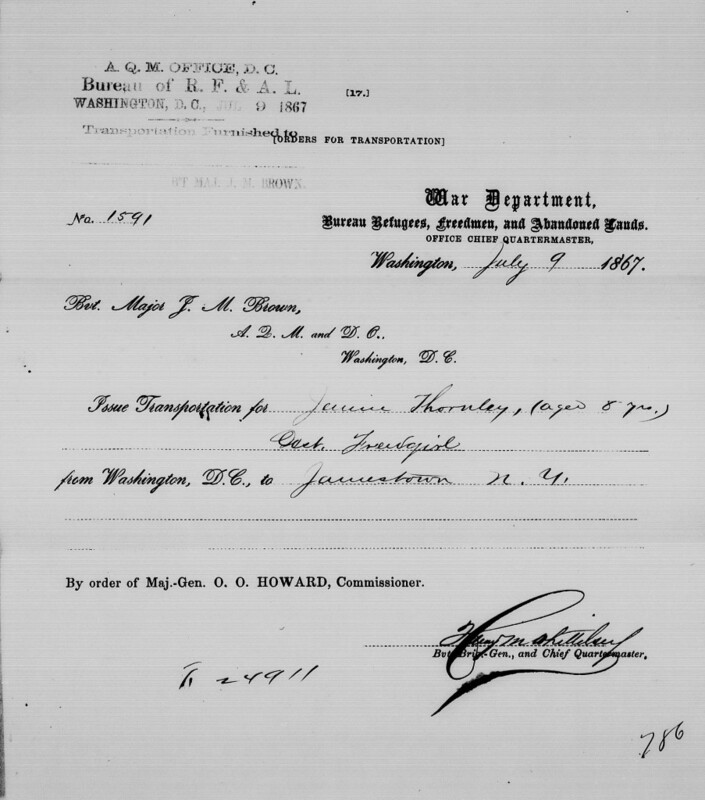 “District of Columbia, Freedmen’s Bureau Field Office Records, 1863-1872,” images, FamilySearch (https://familysearch.org/pal:/MM9.3.1/TH-1971-29866-69459-85?cc=2333782&wc=9J3J-W38:1069293002,1069294301 : accessed 27 December 2014), Assistant quartermaster and disbursing officer > Roll 12, Transportation orders received from headquarters, Jun 18, 1867-Mar 20, 1869 > image 371 of 1159; citing NARA microfilm publication M1902, National Archives and Records Administration, Washington, D.C.
 Ancestry.com. New York, State Census, 1875 [database on-line]. Provo, UT, USA: Ancestry.com Operations, Inc., 2013. Original data: Census of the state of New York, for 1875. Microfilm. New York State Archives, Albany, New York.